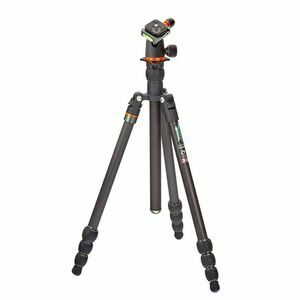 Billy Black is the first full carbon Punk Anarchy tripod from the range, built for everyday use. Billy Black is the lightest tripod in the current line built to withstand everyday life. weighs just 1.38kg and is the easiest tripod to transport in the Punk range. Billy is a tripod with a serious working height, that still extends to 1.37 m / 53.5" without the column installed, giving you a stable, workable solution in even the most difficult conditions. Billy's legs counter fold around the column and head meaning you can get down to just 46 cm. Billy, like all 3 Legged Thing tripods, comes with a detachable monopod leg that can also be used as a microphone or camera boom. 3 Legged Thing's unique Bubble Grip system provides better leverage, and greater rigidity, with smooth, easy to use mechanism. This Black version of Billy can support up to 13 times his own weight with an 18kg payload - meaning he is one of the strongest tripods in his class. 3 Legged Thing's patented Tri-Mount plate offers three hollowed spurs for accessory attachments, and enables Billy to fold up, even when the column is detached.